TL/DR: I’m using this and there are things I don’t understand about this circuit. Ultimately I’d like to read data from this sensor, but all I get is gibberish. Please, help. In my understunding : When GND is disconnected, meaning capacitors are not in the circuit, power rises so quickly, so that counter value is 0. 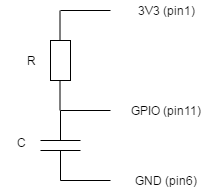 Q1: But, what happens when both pins are disconnected? How come there is anything happening? Why this is so chaotic? As you can see tt is powered from external source. I’ve checked with multimeter, that signal (Vout) is in the range of 3.1V. 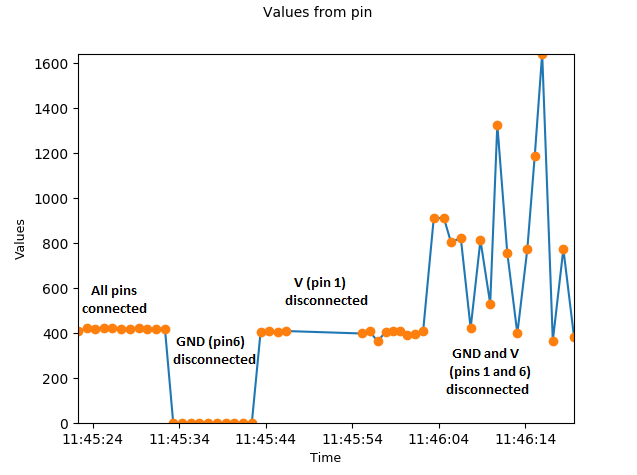 When I connect it this way result is as if both pins 1 and 6 were disconnected – noisy signal witch very high and very low inconsistent values. Q2: Is this setup appropriate for measurement of with aforementioned sensor? 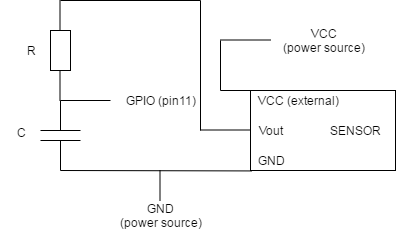 Browse other questions tagged gpio sensor electronics analog-to-digital or ask your own question. Why does an analog LDR (KY-018) work on the Raspberry Pi 3? How can I connect an analog to digital converter (ADC)?